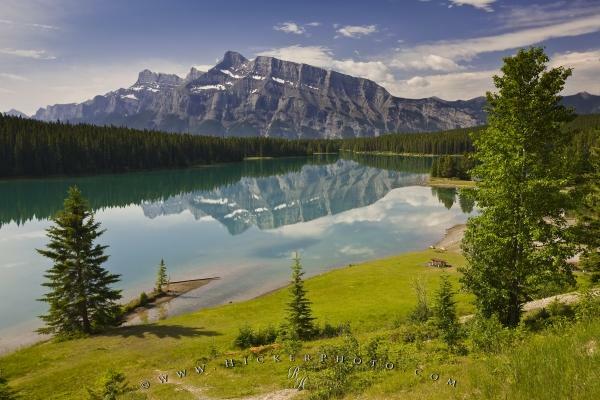 Fringed by lush forest and towering mountain peaks is Two Jack Lake, a peaceful and popular haven for nature lovers, which is situated in Banff National Park in the province of Alberta, Canada. The sight of majestic towering mountains reflecting on the surface of the protected waters of Two Jack Lake greets visitors traveling along the Minnewanka Loop Road in Banff National Park, Alberta, Canada during the summer months. Two Jack Lake offers visitors from around the globe a range of amenities including two campgrounds (a main site and a lakeside site), picnicking, and canoeing - that's not to mention the abundance of wildlife such as bighorn sheep, elk, deer, bears, cougars, wolves and more. Two Jack Lake with mountain reflections along the Lake Minnewanka Loop Road in Banff National Park, Alberta, Canada. Photo of scenic reflections on Two Jack Lake in Banff National Park, Alberta, Canada.